It is finally here. Haven’t you heard? Back in April Aputure released an LED fixture so impressive it won Best Lighting Product at NAB 2017. The LED fixture overcomes many shortcomings of most other LEDs on the market: it casts a hard light, yet can easily accept common light modifiers to make it soft. It is so compact and lightweight that you can use it in even the most remote locations. Since it can be battery powered, the house power and generators are no longer part of the conversation. And the light is VERY bright! And the color is spectacular! And the price is get-out-my-wallet-right-now reasonable! Check our Aputure’s highlights of the C300d then read our thoughts on it below the video! Well, Aputure used a relatively new format for the emitter, called a chip-on-board (COB for short). 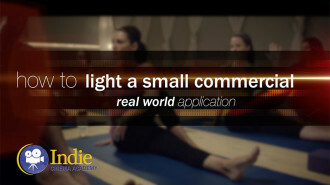 By cramming all of the guts of the diodes all together into a small space, the light essentially becomes a single point source. 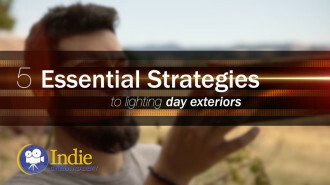 This means that filmmakers no longer have to fight all those weird shadows and hot spots common with LED panels made up of hundreds of little LED diodes. 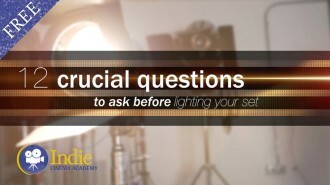 Sure, you could diffuse those panels, but with the Aputure C300d you don’t have to…unless you want to. If you want to diffuse or modify the light from the C300d, Aputure made it super easy: they added a Bowens mount bayonet to the front of the light, which is already an industry standard among strobes that still photographers use heavily. 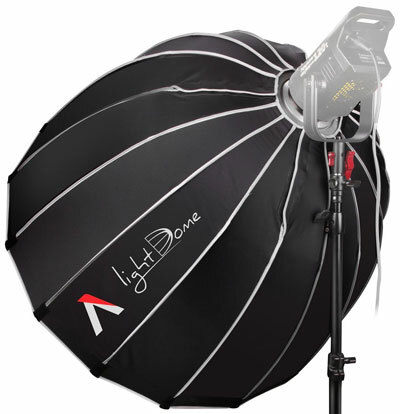 So now you can use all of those light modifiers that you might already have lying around: beauty dishes, umbrellas, soft boxes, space lights. 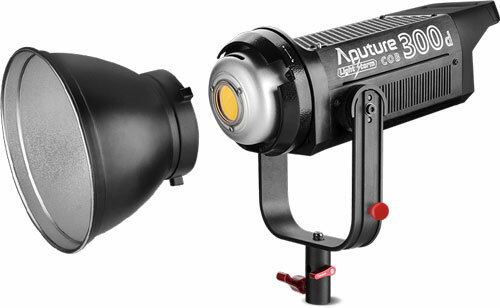 Aputure even has a few of their own: Aputure Mini Light Dome, Aputure Light Dome, Aputure Space Light, Aputure Umbrella along with a sweet fresnel lens that is incredibly lightweight and versatile allowing modifying the beam angle to anywhere from 12 degrees to 42 degrees. And the C300d is bright! With the included reflector Aputure says it is 48,000 lux at 0.5 meter. 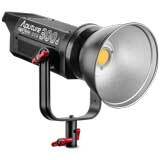 They report that it goes up to 142,000 lux at 0.5 meter when using the Aputure fresnel in spot mode (12 degrees). This is about the equivalent of a smaller HMI, such as a 575W HMI, or a 1kW tungsten. (The comparison is approximate because there are various lenses and reflective housings for different HMI and tungsten fixtures.) Another big plus to point out is that since the Aputure C300d is a daylight balanced LED, it is much brighter than a tungsten balanced LED of equivalent power. The reason is that ALL tungsten balanced LEDs “start” closer to daylight, then each diode or emitter has to be “filtered” to bring it to the tungsten spectrum. 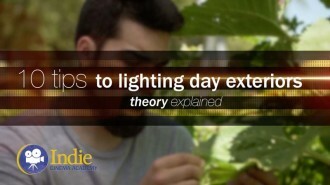 So it is always better to go with a daylight balanced LED and then have the option to filter it to tungsten, than it is to start with a tungsten balanced LED and potentially be forced to gel it to daylight, essentially requiring the light to be filtered twice. 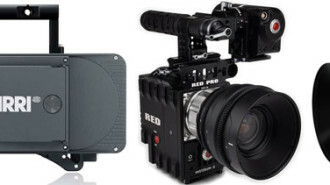 Which brings us to the color temperature and color quality of the Aputure C300d. As with all Aputure lights (as you can see here from our color measurements of all Aputure LEDs), the color quality is amazing. Across all values in the extended CRI, all color values are spectacular except for saturated blue (R12 value), which honestly still isn’t that bad so it isn’t a big deal. 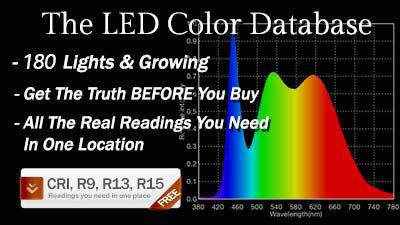 All LEDs currently struggle to have excellent saturated blue and saturated red (R9 value), so to improve those values very expensive phosphors have to be used in the LED diodes. 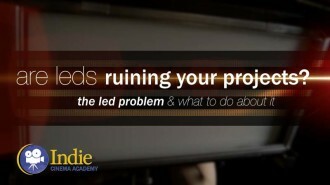 This is often why low cost LEDs have poor R9 and R12 values. For the C300d to have phenomenal saturated red (94.5 out of 100) and decent saturated blue (84.8 out of 100) says they put in the expense to use top of the line phosphors. To put this saturated blue value in context, most of the highest ranked daylight balanced fixtures in our complete LED database have saturated blue values between 84 and 90. The saturated red value is much more important since it affects skin tones. Our color temperature reading at NAB 2017 was a bit warmer than what Aputure is currently stating for the Light Storm C300d; they list it as 5500K while we measured it as 5143K. Being that their graph shows a CCT of 5717K, it is possible that they tweaked the phosphor mix or magenta filter slightly since we looked at the light at NAB. With the Aputure C300d being so bright, in addition to it being a chip-on-board design which compounds things, it is a given that this LED gets hot. 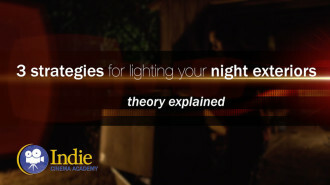 Definitely not as hot as tungsten or HMI fixtures – not by a long shot – but all LEDs still generate a lot of heat. Since LEDs are fairly sensitive to heat and can be damaged or their lifespans decreased when used for long stretches in hot environments, it is very important to dissipate all that heat. Aputure’s answer was not one but two fans! Before you get concerned that this is going to ruin your audio, you really must experience these fans. Back when we reviewed the Aputure C120d LED fixture, we didn’t even know it had a fan until we SAW it STOP spinning! That’s right: the fan was running for a while without us knowing it, and our only clue was visual not auditory! Adding a second fan to the C300d could potentially double the amount of sound, but doubling nothing is still nothing. But to be sure that as little sound is produced as possible, Aputure designed the fans to each run at different speeds so that any sound each made would be at different frequencies. Ingenious! Ok, with a light that is bright AND has fans, you might think it is a power hog and needs its own circuit, right? Nope. It only draws 300 watts, so you can place six C300d fixtures on one 20 amp circuit, which is common in homes. Plus since the C300d takes two Anton Bauer or V-mount batteries, you can easily power this fixture in remote locations where generators or line power isn’t possible or practical. Aputure reports that you can run the C300d for an hour and a half when using two 230Wh batteries, which is incredible. My favorite accessory that Aputure includes standard is a small remote that controls not only this light, but other Aputure lights on your set. 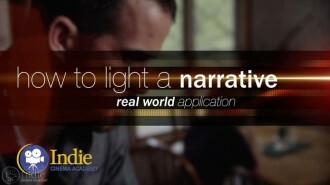 When we first started working with Aputure lights three years ago, remotes were unheard of. (In fact they still are very rare.) 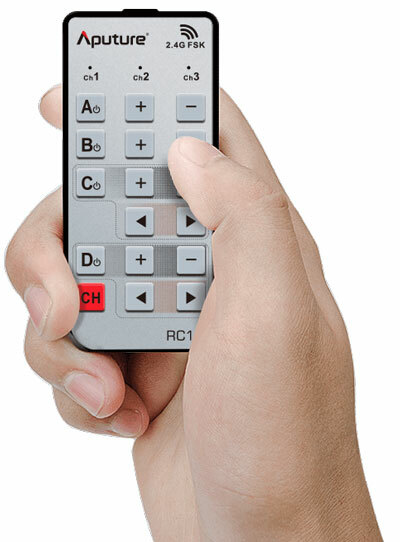 So we didn’t see how empowering such a little remote can be. Visualize this: you have fixtures mounts all over your set, sometimes high up, sometimes in awkward to reach places. Yet once you place the light you never have to touch it again since you can turn each light on individually, as well as dim them perfectly. Now the gaffer (or perhaps the DP themself) can stare at the waveform on the monitor and dial in each light to their preference. No ladders to turn dials on the back of the fixture or adding scrims / ND gels, no adjusting ballasts. Despite all that the Aputure C300d offers, one thing it doesn’t require is a big pocket book. For whatever reason Aputure always keeps their products VERY reasonable. 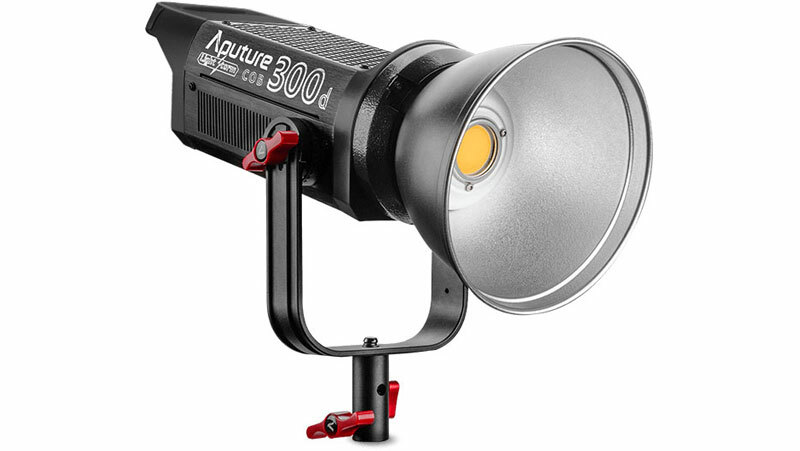 Currently the Aputure C300d LED is listed for $1099 (USD), which is half what their competitors would charge for a similar fixture. My only guess is that Aputure is more interested in helping filmmakers get quality lights than to make insane profits. 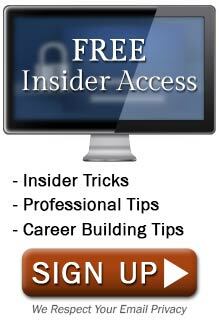 Definitely builds a lot of trust in the industry. From the numbers I’ve seen, the C300d is a lot brighter than the 120d, between 2-3 times brighter. The tricky part is comparing it to true tungsten fixtures, since those have different geometries. For example, in true tungsten the bulb is sitting inside of the fixture changing the way the light bounces around in and through the housing. With the 120d, 120t, and 300d the emitter is on the rear surface of the fixture. As a result an important detail is what type of housing, any lenses or reflectors, angle of spread, distance from light, etc. I’d say that the often repeated claim of the 120d being a 1.2kW equivalent is much too high. Unfortunately you must have tested the light at one of the shows. 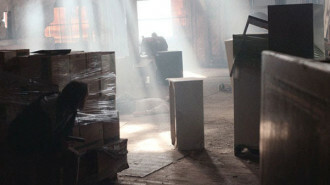 The production light does not perform as well in terms of color quality. The r9 is somewhere between 75-82. If you remove the reflector, many people report a very obvious green fringing on the light. I think you should look into this and update your article before some people begin assuming you guys are one of the many Aputure propagandists out there, who just want to keep getting free gear. They make great products but so far wolfcrow seems to be the only one being honest in his reviews. I hope Aputure will have the confidence to keep sending him their gear to review. They’re a great company and should be open to honest reviews. Yes, we tested the C300 at NAB 2017 (April 2017). There were some long delays in getting it to market, so I wouldn’t be surprised if they had to do some modifications in the production model. I remember Aputure saying at NAB that they mounted a magenta filter on the front of the chip, so the green fringing makes sense; either they changed the magenta filter or maybe they removed it. We will definitely retest the C300d once production is in full swing, which will be another month. Wolfcrow does great work, as do many other review sites out there. 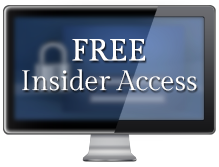 As with those sites, we are 100% honest about our reviews, while at the same time staying positive throughout our discussions. If we come across a lackluster product, we often just skip reviewing it. In regards to Aputure, we have always found great value in all of their products and so say as much in our reviews. I have yet to find anyone who were disappointed in their fixtures or other products. Agreed about Aputure. Just some of the reviews out there omit (not you guys) obvious drawbacks to some of their products that consumers ought to know. Wolfcrow did a wonderful job being objective in his review on the tri8 panel, where others seemingly chose not to shine a light on drawbacks that may affect a buyer’s interest in the product. I just glanced through Wolfcrow’s tri8 review. Some interesting observations. His statement about needing to add green is very strange, as is his method for determining it. I just looked back at my Duv values for the Tri-8. (Duv — also called delta uv — measures how far from the blackbody curve the light is at that CCT value. Here’s a Duv explainer article from Yuji International along with green/magenta shift.) My readings for both the Tri-8c and the Tri-8s show they are essentially right on the curve, meaning no plus green or minus green is needed. (Duv for Tri-8c at 2300K was -0.00141 and at 6000 K it was 0.000292; for Tri-8s at 5100 K it was -0.00185. For comparison, these values are in the same range as ARRI Skypanels and Mole-Richardson LEDs, and slightly better than KinoFlo LEDs.) I didn’t measure the Tri-8c in the 4000 K CCT area so it might need green there, but at 2300 K and 6000 K it doesn’t need green filtration. Another thing is that my readings show the CCT is essentially 6000 K when the light is set to 5600 K, while Wolfcrow says it is 5100 K when set to 5600 K. All this to say that his use of a camera to determine CCT values and green values might be causing him problems. 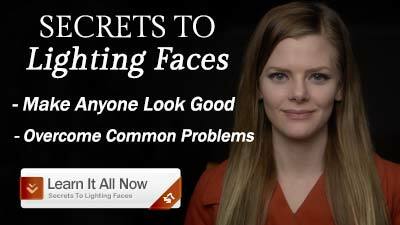 If the camera’s programmed white balance isn’t correct, everything else will be skewed. We use an Asensetek Lighting Passport spectrometer, so we get complete information on the entire spectrum. Thanks for those clarifications. I think the best part of his review is the thoughtful reactions to some of the design decisions and usability of the unit. Many quirks went unmentioned in some of the other reviews. You guys are truly the standard when it comes to color quality analysis. That’s for sure.